I don’t know what’s gotten into me. 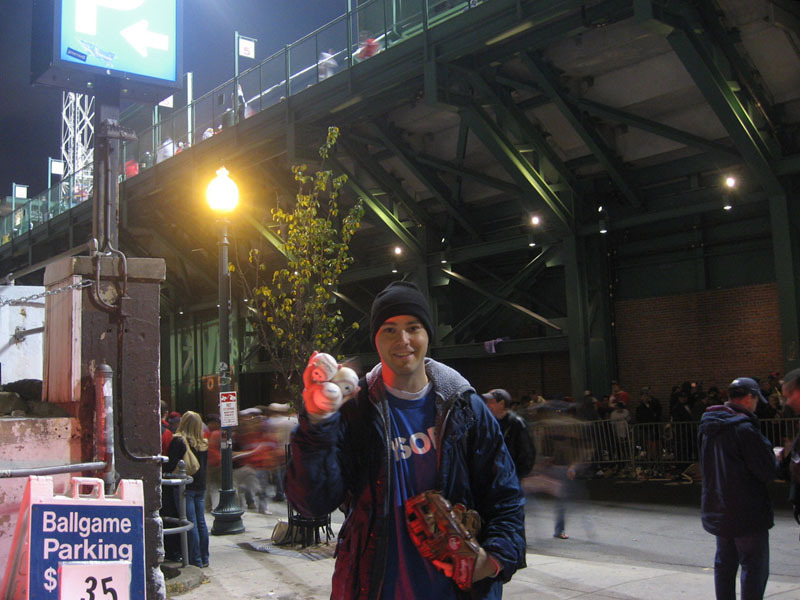 In the past, I never considered spending an entire game outside a stadium, let alone driving 200 miles to do so–but that’s exactly what I did for Game 1 of the World Series at Fenway Park. I didn’t REALLY expect to snag any balls, and I wasn’t sure if I’d even have a good time. The weather forecast said there was a 20% chance of batting practice. I figured there’d be a ton of competition from other ballhawks during the game. I knew I wasn’t going to see a single pitch. And yet for some strange reason, I was okay with all of that, in theory. It was an experience, or at least that’s what I kept telling myself as I drove through Connecticut and into Massachusetts. I parked at my friend’s place in Lexington at 2pm, got a ride (from his wife) to his school where I’d be giving a speech the next day, got another ride to the subway (or the “T” as they call it in Boston), and found myself walking across a bridge toward Fenway Park more than four hours before the first pitch. 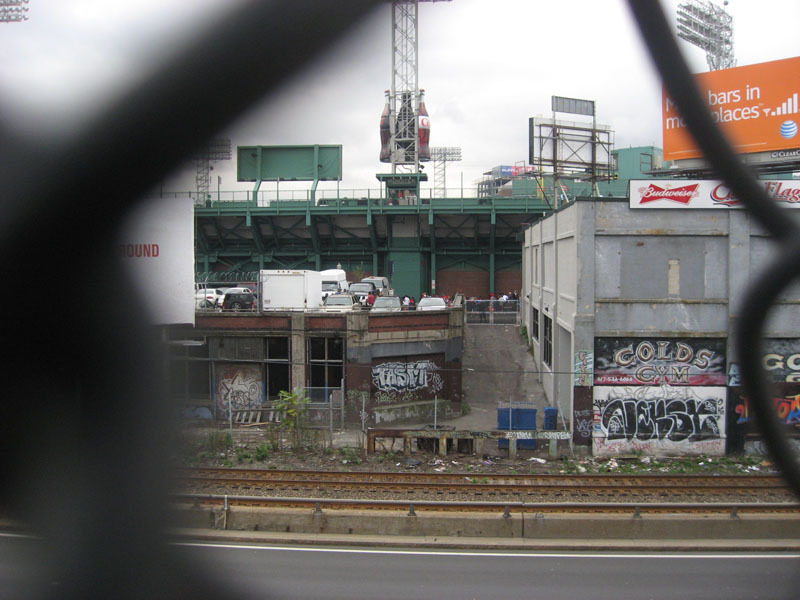 I turned left at the top of the hill and got my first look at Lansdowne Street…the area behind the Green Monster…the place where I’d be hanging out for the next eight hours. There was a HUGE line of fans camping out under the overhang of the Monster Seats. 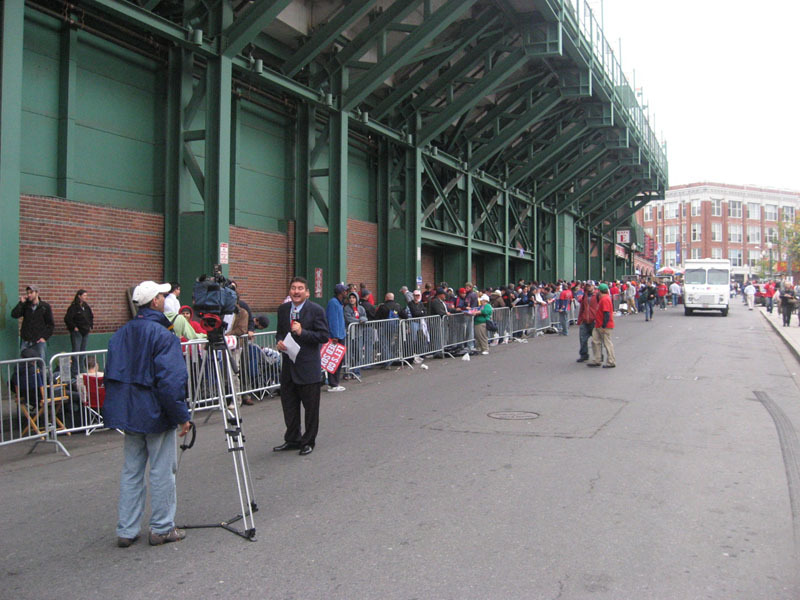 The people at the front of the line had tents and lawn chairs and told me they’d been there for two days because they heard the Red Sox would be releasing “a couple hundred tickets” at game time. These people were completely riled up, as you might expect, and they were yelling at everyone and everything. When a UPS truck drove slowly down the street, the whole line started chanting, “YOO-PEE-ESS!!! YOO-PEE-ESS!! !” And when a couple of Rockies fans walked by…forget about it. Garbage was thrown. Obscenities were screamed. It was disgusting and fantastic. Anyway, it made me feel better to know that I wasn’t the only fan without a ticket and that there were people who traveled even farther than me. I talked to one guy who flew in from Texas just to hang out and soak it all in. The sky cleared up a bit, and I became hopeful that maybe, just MAYBE, the teams might take batting practice after all. Of course I couldn’t see the field from the street, so I looked up and waited for someone to walk by at the back of the Monster Seats. There were some photographers milling about and a few vendors setting up. I even saw Red Sox owner John Henry up there for a couple seconds. Everyone was walking fast or busy working, and the street was so noisy that I knew no one on the inside would hear me. Finally, though, after about ten minutes, there was a lull from the people camping out just as a security guard happened to stop at the fence up above and peer down. “Yo!! !” I yelled and waved my arms. He looked over his shoulder, then turned back toward me and shook his head. Before I had a chance to get excited, some guy with a media credential walked over and said he was just inside the stadium and saw the infield covered. I didn’t know what to think. Maybe the tarp had just been removed within the last five minutes? I wanted to hang out on the roof of the garage across Lansdowne. I figured that’s where most of the home runs would land–that is, if there was even going to be batting practice. I still had no idea what was happening inside the stadium (which was beyond frustrating, let me tell you), so I went about my business as if the teams were going to hit. What else was there to do? I started walking up the ramp to the roof of the garage and was immediately yelled at by the employee flagging cars in the street. He knew what I was up to and screamed that the garage was private property and I was trespassing. Fair enough, I thought. It cost $35 to park there. Maybe the guy was holding out for a bigger bribe so he could afford to take care of his missing teeth. “GET LOST!! !” he yelled and began marching toward me. “Thirty-five bucks,” I said, back-peddling. “I’M CALLING THE COPS!! !” he threatened again, and I had no choice but to let it go. At least he wasn’t picking on me, specifically. While I was (amazingly) the only fan with a baseball glove, the garage guy was screaming at everyone, even at a couple of well-dressed fans who paused briefly at the bottom of the ramp to take pictures. I was forced to stand on the sidewalk in front of the garage, and to my right. Not good. I was too close to the Monster. If any balls happened to clear it, they’d probably sail way over my head. I regretted driving all the way to Boston. But I wasn’t about to give up. I still didn’t know whether there was going to be BP. And if there was, I had no idea when it was going to start. What could I do? I got into position and put on my glove and stared up. This made other people stop and stare up too. “Anything come over yet?” asked a guy with a World Series ticket in a plastic sleeve that was attached to a lanyard dangling around his fat neck. “Any luck?” asked another guy two minutes later. A third guy walked over and started talking to me–and never stopped. What was I doing? Did I ever catch a ball before? Did I have an extra ticket? Where was I from? Who was I rooting for? What did I think of the Rockies’ chances? How about the weather? How about the Patriots? Is this great or what? “I’m not IN your space!” he shouted in my ear, his breath reeking of alcohol. He kept talking to me. I ignored him. He finally took off. I looked down at him for a split second and spotted his media credential. 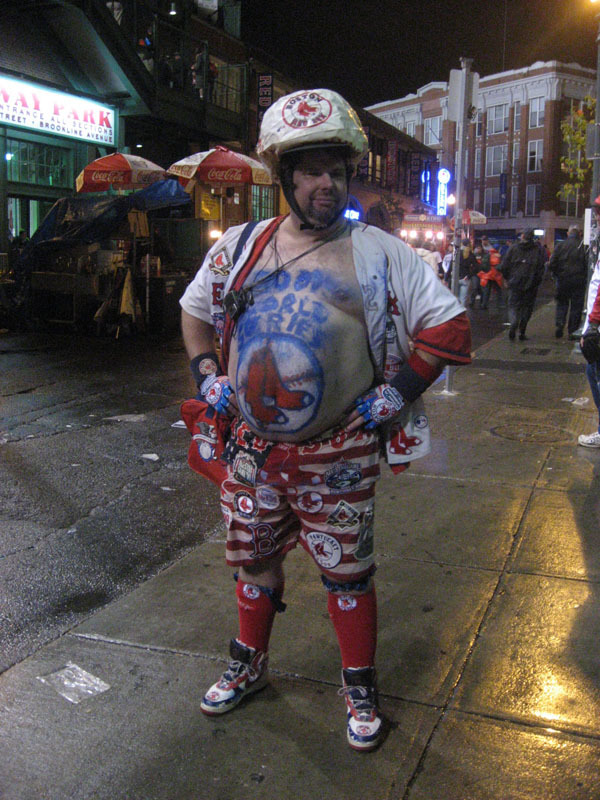 He identified himself as Mike Dodd from USA Today and said he was doing a story about the fans outside Fenway Park. He pulled out his reporter’s pad and asked a bunch of questions and scribbled furiously as I explained what I was doing. A woman walked up next to him and started taking pictures with a fancy camera. “This is my photographer, Eileen,” he said. We were done five minutes later. He thanked me for my time. I asked him when the piece was going to run. “Tomorrow,” he said. 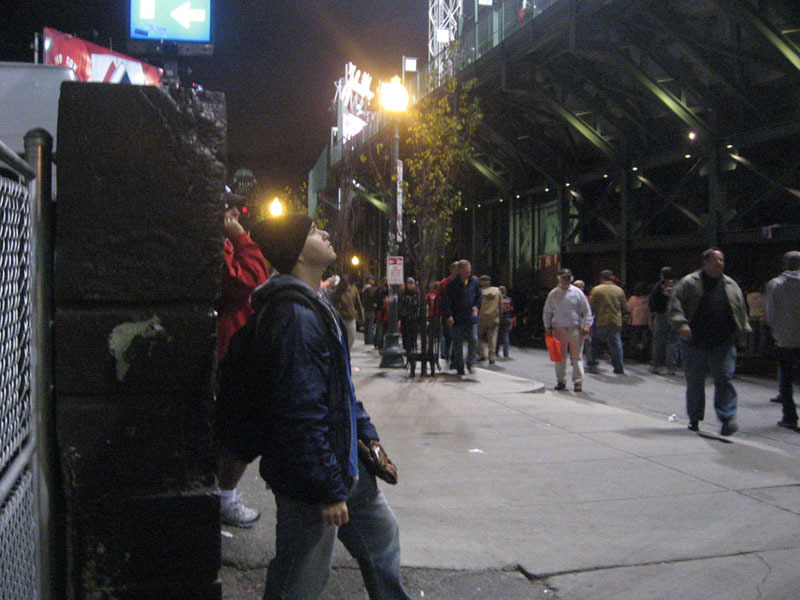 After a little while, and without any warning, a white speck came shooting over the Green Monster to my right, smacked off the brick facade of a restaurant, bounced back toward the Monster, deflected off the bottom of a food cart, and rolled back toward me across Lansdowne Street as dozens of oblivious fans walked past. I ran forward and grabbed it with my bare hand, and just like that, my whole trip was validated. A dozen people walked over and asked to see the ball. Did it have a World Series logo?! No, it was just a regular ball, but still, it was pretty cool to have snagged one like that. Remember the first photo in this entry? If you don’t, scroll back up and take another look. 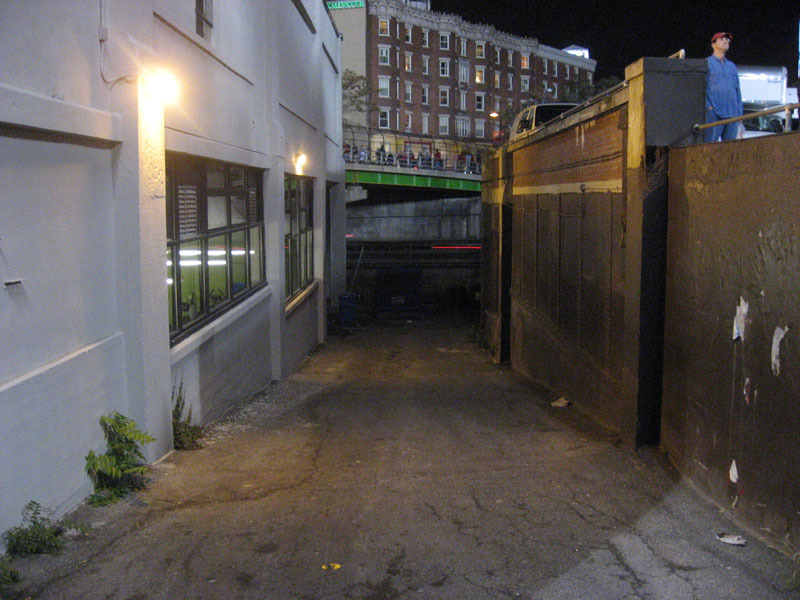 See the sloped alley between the garage and the gray building? See the fence at the top of the alley? It was locked, and I was already thinking about climbing over it if a ball happened to land there. As I walked back up the alley, I held the ball between my thumb and index finger as if I were holding someone else’s dirty underwear. The ball was in serious need of being wiped off, but I didn’t have any napkins on me, and I had to climb back over the fence, which meant that somehow I was going to have to tuck the ball into…something. Ewww. I put the ball in my glove, shoved the glove in my backpack, climbed back over the fence (people were so eager to help me get down that I wasn’t able to jump down until they got the hell out of the way), and got some napkins from The Sausage Guy. 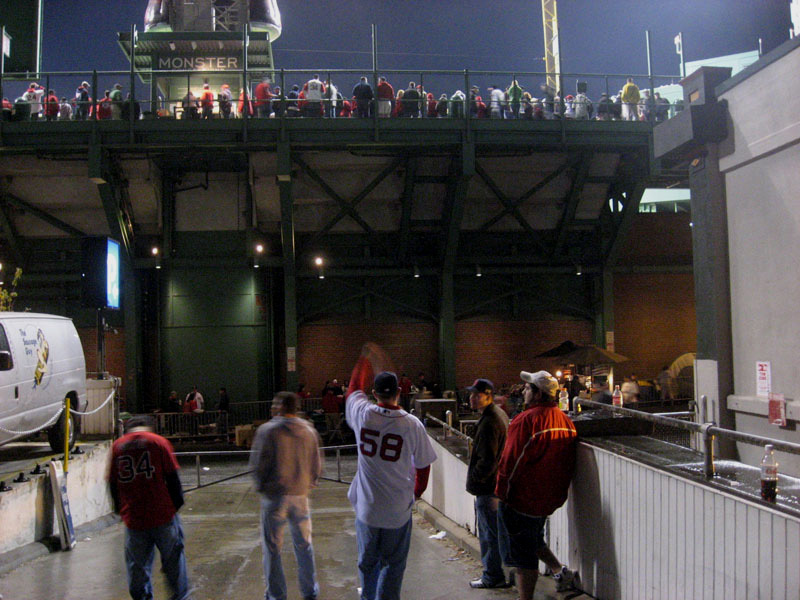 When I walked back to the fenced-off alley, two big guys wearing Manny Ramirez jerseys offered to buy the ball from me. “How much you want for it?” they asked. “C’mon, you got two of ’em!” they said as another ball flew over the Monster and landed in the alley. “And I’m about to have three,” I said as I scampered back over and chased the ball down the hill. When I returned to the street, one of the guys pulled out a crisp fifty-dollar bill and waved it in my face. They wouldn’t let it go and kept harassing me. That was it for BP. A few other balls (all regular balls) had reached the garage roof, and a couple others had barely cleared the Monster and landed on the street in front of the garage. 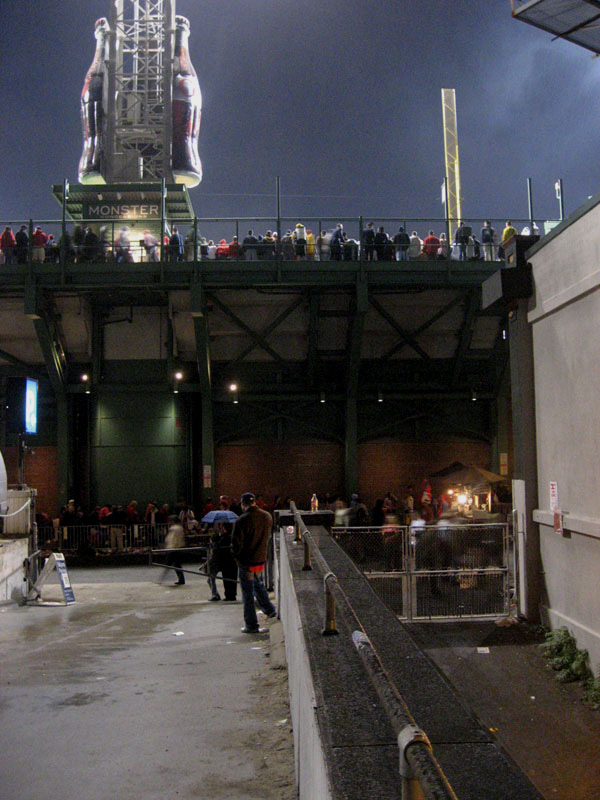 Throughout BP, I kept flinching every time a moth or bird flew over the Monster. All I could do was look up for white specks, and since I couldn’t hear the crack of the bat, every little speck that moved made my heart race. …and took pictures of other…characters. By the time the game started, the mean garage guy was gone, and the few other employees didn’t stop me from hanging out on the roof, free of charge. I wasn’t allowed to wander in between the cars (even after I explained that I’d protect windshields from being smashed), but as long as I stayed on the ramp behind the entrance, I was fine. This forced me to play close to the foul pole, but still, I liked my chances. If anyone hit a ball just to the right of the Coke bottles, I was going to have an easy catch on the fly. 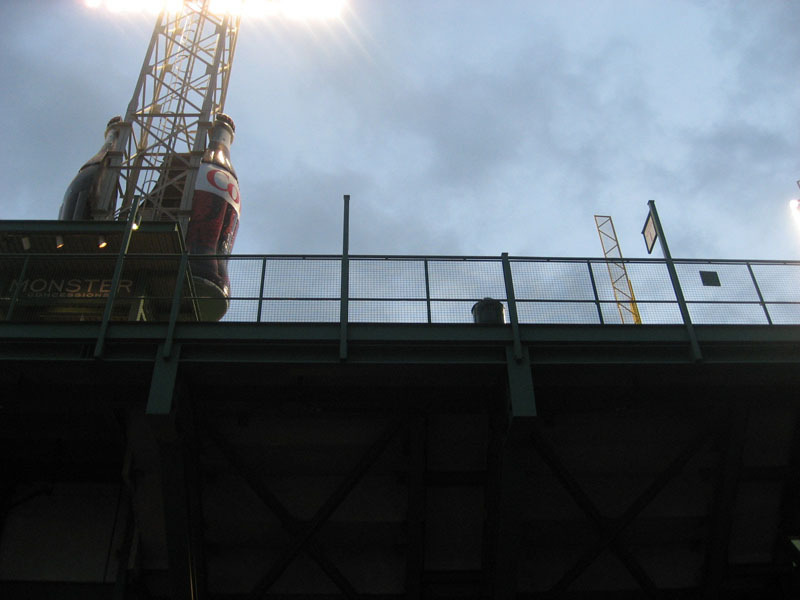 If a ball sailed just inside the foul pole, I was going to jump into the alley. And if a home run landed in the tight cluster of cars on my left, I was going for it. I didn’t care. I was ready to CLIMB on the **** windshields if I had to. I couldn’t believe how little competition there was. For at least half the game, I was the ONLY person on the garage roof. At times, there were as many as half a dozen guys, but none of them had gloves, and none of them were really paying attention. At worst, they were just going to be obstacles that I had to run around. I had an old walkman with a cheap pair of headphones, and that’s all I needed to follow the action. Unfortunately, the radio broadcast had a five-second delay, so I had to stay alert and keep looking over the Monster at all times because I never knew for sure when a pitch was going to be thrown. Sometimes I could figure out what was going to happen based on the crowd’s reaction. Whenever the count reached two strikes on a Rockies batter, I knew it was going to be a strikeout if the crowd suddenly went wild. Other times, I correctly predicted slow-rolling groundouts based on the crowd’s steadily increasing cheer. If I stood in just the right spot on the ramp, I could see a portion of the jumbotron and get partial glimpses of the replays. It was a challenge like no other I’d ever experienced as a baseball collector. Just the fact of not being able to see the batter made it a unique experience, and for that reason, I had to stay more focused than ever. I also had to plan my appetite so I wouldn’t get hungry during the game, and as thirsty as I got, I had to force myself not to drink water because I needed to cut down on my trips to the bathroom. Apparently, the fans who’d been camping out for tickets had similar bathroom issues and, based on overpowering stench of urine, had been relieving themselves at the back of the garage. No way I was doing that. 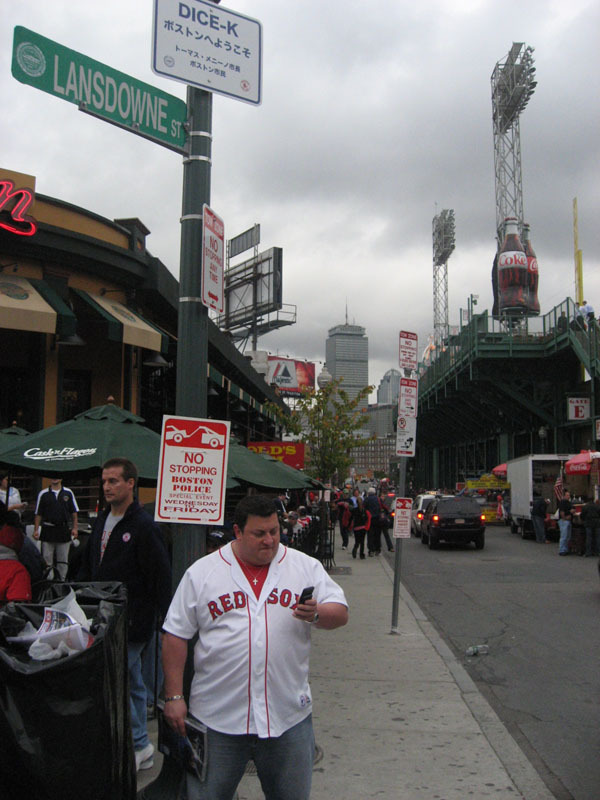 Before the game, I snuck into a Popeye’s and used the facilities, and during the extended seventh-inning stretch (“God Bless America,” indeed), I raced to the corner and conducted business inside that big obnoxious bar called Cask ‘n Flagon. Another challenge was staying on my feet for eight solid hours and craning my neck upwards at the wall. It rained for most of the game, not hard enough to halt the action, but enough to make everything in the parking lot too wet to sit on. I was in constant discomfort, but it was worth it. Like I said, I wasn’t sure if I’d have a good time, but I ended up enjoying every second. Oh, and another challenge…dealing with all the people who kept asking me what was happening with the game (Get your own **** radio!) and if I’d caught any balls. Every time someone talked to me, I had to take off my headphones and ask them to repeat themselves and struggle to stay focused on the Monster. This was only my second World Series game. The first was Game 5 back in 1993 when Curt Schilling, then with the Phillies, pitched a shutout at the Vet against the Blue Jays. I was inside the stadium for that game and only managed to snag one ball. Dustin Pedroia led off the bottom of the first inning with a home run to left field, but the ball didn’t come close to reaching the parking lot. In fact, it barely cleared the Monster and bounced back onto the field. And that was the only longball of the game. Josh Beckett sounded sharp. (Can’t say he “looked” sharp.) The Rockies were lame. Final score: Red Sox 13, Rockies 1. I wanted a ticket stub, and just as it occurred to me that people probably wouldn’t be giving them away for free, some guy walked along Lansdowne Street with a professionally-made sign that said, “WILL PAY $20 FOR TICKET STUBS,” and no one bothered to take him up on it. I gave up before I started. To hell with it. I wasn’t about to pay over $20 for a ticket stub for a game I didn’t even see. Instead, I spent $15 on a Manny Ramirez tee-shirt which you’ll get a glimpse of in my next entry. • 314 balls in 40 games this season = 7.85 balls per game. Marvelous entry! I admire the fact that you envisioned making the trip to try to snag without entering Fenway. It sounded totally off the wall. Which, of course, is where you needed balls to come from. Anyway, your story kept me riveted. And I’m amazed that you maneuvered into positions to make the 3 grabs. Your enthisiasm for the game is 100% – and great fun to observe. Congratulations, dude! now that you caught three balls will you count the game in your streak? What a great day at the old ballpark. Nice job on snagging three. Just out of curiousity, what were scalpers getting for tickets out on the street? I “snagged” 4 pucks at the Isles game tonight, a new record for me. The first from the trainer, the second and third fell from the netting. I gave the second puck to a little girl, then I got number 4 from security. Couldn’t get a fifth at the end of the period, cuz all 3 people snubbed me, even though they acknowledged me. awesome, really awesome. thats great that you got 3.
anne-i got the same thing from the mariners. i LOVE fan packs. The never ending Game 3 gave me a chance to read your blog and it’s a great story and I think it would make a great magazine article–somewhere. The same way CBS News did a story on you last year, you should get Sports Illusrated or ESPN the Magazine to do a piece. In my humble view, this Fenway/non-ticket World Series snag effort is as interesting as anything George Plimpton ever did (look him up young ones). There is also one more thing I agree with in your story–you do have a sickness. May you never recover! Nicely done, I’m still trying to recover from staring at that picture of the “belly dancer” too long…. John: I’m pretty sure that the bus waits at the players entrance. Just walk around the Colesium once, and you’ll find it. There is usually a crowd, and sometimes they sign, sometimes they don’t. I think that if it’s a big name player (Sidney) then you should wait at the ticket office way before the game(Saturdays work best with this) and just wait for them to walk over from the hotel. So you DID end up snagging more 2007 playoff balls than me… Well I’m HAPPY that you did, lol. Well i guess it was worth the drive, huh? Nice Zack too bad you couldn’t get in though or have any long balls hit over the Green Monstah. Im off to a watch party to see my sox win it all. Yeah, the game definitely counts toward my streak. I heard that standing-room-only tickets were going for $300, but I find that hard to believe. One guy said he bought two “grandstand” tickets from a scalper for $650 apiece. Ouch. Congrats on your new record. Thank you, thank you, thank you. I wish I had better connections to make the magazine piece happen. I guess I’ll start by mentioning your idea to my agent to see if she thinks it’s possible. Ha! How about that. Didn’t cross my mind until right now. Thanks. Yeah, definitely worth it, although the lack of longballs during the game was a major disappointment. Could the Sox please lose the next two games so I have another chance to snag at Game 6? Zack, if you think that the Rockies will win the next two, then you definetly have a sickness. When will game two be up? And change the ball count at the top of the blog. It’s still on 3272. See the Red Sox in April. They’ll have some leftover WS balls. a-rods opting out, where does everyone think he’s going? omg i hope the rockies come to shea next april. ill be at every game. maybe theyll give away ws balls to forget the memory of the sweep. I know im so excited. i hate the yankees. i hate a-rod. hes a disgrace to the game. hes a jerk. he cant hit in the playoffs. if the mets even make an attempt to think about TALKING about him ill be mad. he slaps the ball from peoples gloves. he yells at infielders so they cant make a play. bobby kielty just homered. 4-1 sox. 2007 world champions boston red sox. congrats. (btw im confident the rox will comeback to win in 7. lol. imagine…) wow. long post. YEAH 2007 WORLD SERIES CHAMPS!!!!! The Mets have no where to put A-ROD. I’m more upset that BORAS, not A-Rod, chise to announce it in the middle of the WS. Maybe that A-Rod is gone, the Curse of the A-R-od will be lifted. Joe Girardi has been offered a job. We should have an A-Rod contract sweepstakes. Whoever guesses closest to the final contract wins. Thanks. I always wonder which fan gets the most balls at any given game…and what that ball total is. Is it possible that my three really beat everyone else that day at Fenway? I wouldn’t bet on it. There’s probably some dweeby seven-year-old kid with no legs who sat right behind the Sox dugout and got a ball handed to him every half inning. I’m hoping to have the Game 2 entry up some time today, or at least by the time I go to bed. Thanks for spotting the non-updated ball total. It’d been so long since my last game that I forgot all about the snag-O-meter at the top. Hopefully to an American League team. Then I can still go for his homers at Yankee Stadium, Camden Yards, and (outside of) Fenway Park. If he goes to the National League, I’ll be forced to stalk him at Shea (lame) and Citizens Bank (crowded). Not good. I think he’s going to the Angels. Or what about the Phillies? They need a 3rd baseman, don’t they? Can you imagine A-Rod hitting in that little joke of a ballpark? That guy with the painted stomach is in MVP Baseball 2005. You know how EA Sports has a short intro with different snippets of film of the sport related to the game. 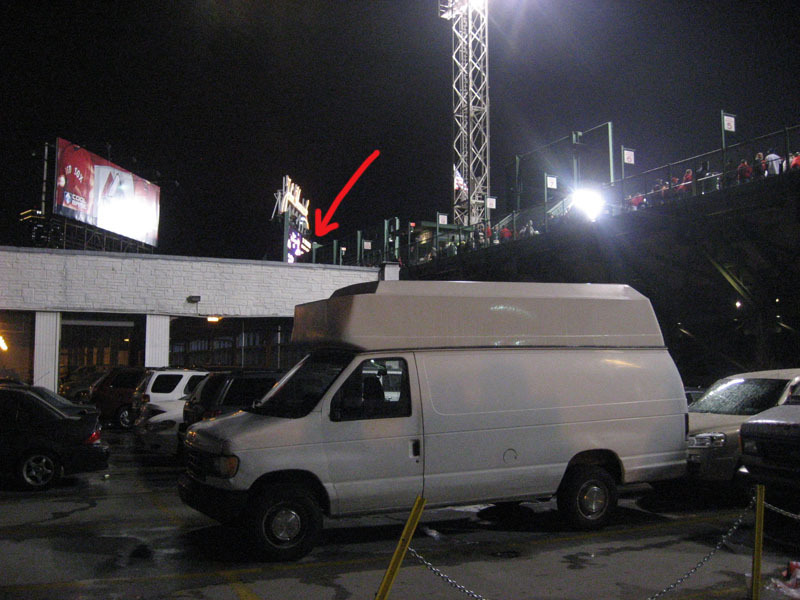 That guy was everywhere after the Sox won it in 2004.